As tensions with store owners grow and accusations of draconian cost-cutting fly, coffeehouse Tim Hortons is in need of a sales jolt. The chain, owned since 2014 by Restaurant Brands International, has posted flat or slightly negative same-store sales for four consecutive quarters, fueling investor concern about competitive threats and franchisee discontent. Tim Hortons came under fire last month after some store owners, including the children of the restaurant’s co-founders, scaled back staff benefits and cut paid breaks in order to offset minimum wage increases in Ontario. Enraged, some customers vowed to boycott the brand. In a Jan. 11 note to clients, BMO Capital Markets analyst Peter Sklar described fear over the backlash as “overblown” and predicted the “negative publicity should die down in the coming weeks.” Investors will soon find out how much damage was done by the turmoil when Restaurant Brands reports quarterly results later this month. 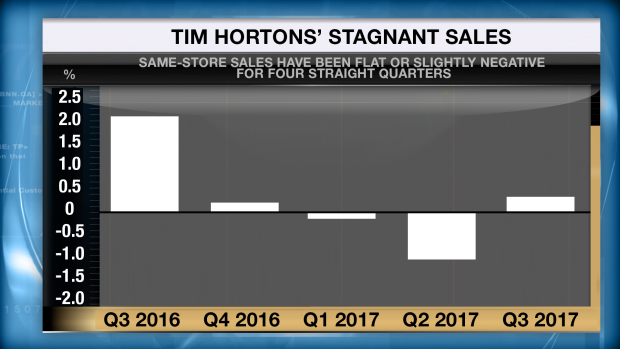 Others, meanwhile, fear the underlying issue – escalating friction with franchisees – could affect Tim Hortons’ growth rate. Several store owners, many represented by the recently-formed Great White North Franchisee Association, allege Tim Hortons’ cost-cutting measures have damaged the brand and are squeezing store profitability. Stagnant same-store sales have also intensified investor concerns about the growing threat of McDonald’s pushing into the breakfast segment. Indeed, the U.S.-based giant’s McCafé concept and all-day breakfast initiative hit their stride in Canada around the same time Tim Hortons’ sales started slipping. Amid the battle for consumers’ loyalty, Restaurant Brands CEO Daniel Schwartz touted the revenue-generating power of Tim Hortons’ new espresso-based drinks and mobile app during company’s most recent call with analysts. Brian Madden, senior vice president and portfolio manager at Goodreid Investment Counsel who does not hold Restaurant Brands shares, agrees the initiatives could help. For Bruce Winder, co-founder of the Retail Advisors Network, the key to Tim Hortons’ future sales success lies in its relationships with stakeholders.